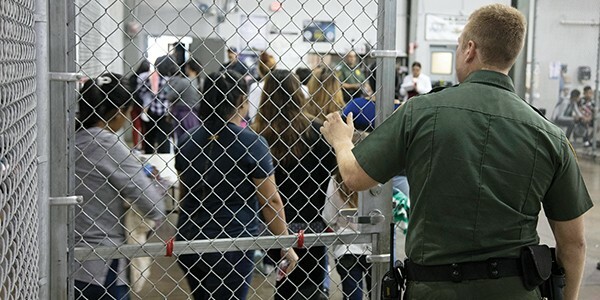 Children line up inside a U.S. immigration detention center. Eight faith leaders from the Memphis area joined about 70 others from around the state Tuesday afternoon in delivering a letter to Tennessee Governor Bill Lee, urging him to affirm the value of welcoming immigrants and refugees. Fred Morton, and Tondala Hayward of the United Methodist Church. “We are, therefore, deeply saddened by much of the recent rhetoric and legislative actions that run counter to these deeply held beliefs,” the letter reads. “In this legislative session alone we have seen bills aimed at denying birth certificates and housing to immigrants, as well as an extreme resolution in support of ending birthright citizenship. These actions display our state, and our state’s government, as unwelcoming and cruel." The legislation of concern is largely sponsored by Rep. Bruce Griffey (R-Paris), who has said he wants to make Tennessee the “last place” an undocumented immigrant would want to live. The first piece of legislation, HJ R47, is a resolution that would have affirmed President Donald Trump’s efforts to end birthright citizenship. The resolution failed last week in a House subcommittee. Griffey is also responsible for HB 0562, a bill that would have imposed taxes on money transfers in order to raise funds for the construction of a wall at the country’s southern border. That measure also failed earlier this month in a House subcommittee. Another bill introduced by Griffey, HB 0614, would have made it a crime for landlords to lease to undocumented immigrants. It was sent to a summer study Tuesday afternoon in the House Commerce Committee. One of the few remaining immigration-related bills sponsored by Griffey is HB 0662. It would prevent the state from registering birth certificates to a child born to “a mother who is not lawfully present in the United States unless the father is a U.S. citizen” and can provide documentation to prove it. It is not clear when that legislation will be heard in a House committee again. “We know that you are a person of faith, and we know that faith leads you to value and respect the worth and dignity of all people, no matter their documentation status or country of origin,” the letter reads. “May you remember that they too are Tennesseans, and they too are children of God. The faith leaders' Tuesday actions were co-organized by the Tennessee Immigrant and Refugee Rights Coalition, the Tennessee Justice Center, and Open Table Nashville.